UILabel is used to display the static Contents. For Example, "Email", "Password" or anything. It can be a single line or multiline. Open Xcode Goto File > New >Project >Single View Application > Enter Project Name (eg :- FirstProjectViewController) and Select Language as Swift > Done. 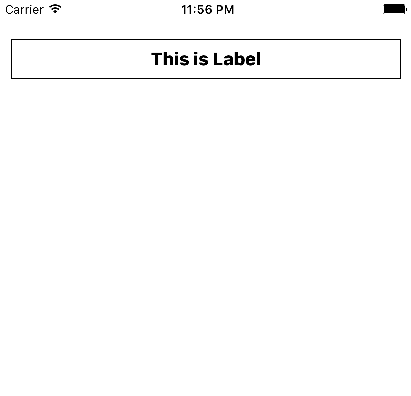 Grab the concepts of UILabel in iOS here in this Example. nameLabel.text = "Thie is Label"
Below Code itself is self explanatory. Firstly, we initialized a "nameLabel".Then added it to self.view and assigned it some text and given textColor with "UIColor" class and font with "UIFont" class. .layer property is used to give borderWidth, borderColor, cornerRadius. To give borderColor along with .layer property you have to give .cgColor at the end as you see in the given example. 1) What do you think the frame of an UIView is the rectangle, expressed as a location (x,y) and size (width,height) relative to the superview it is contained within? 2) What do you think the bounds of an UIView is the rectangle, expressed as a location (x,y) and size (width,height) relative to its own coordinate system (0,0)?